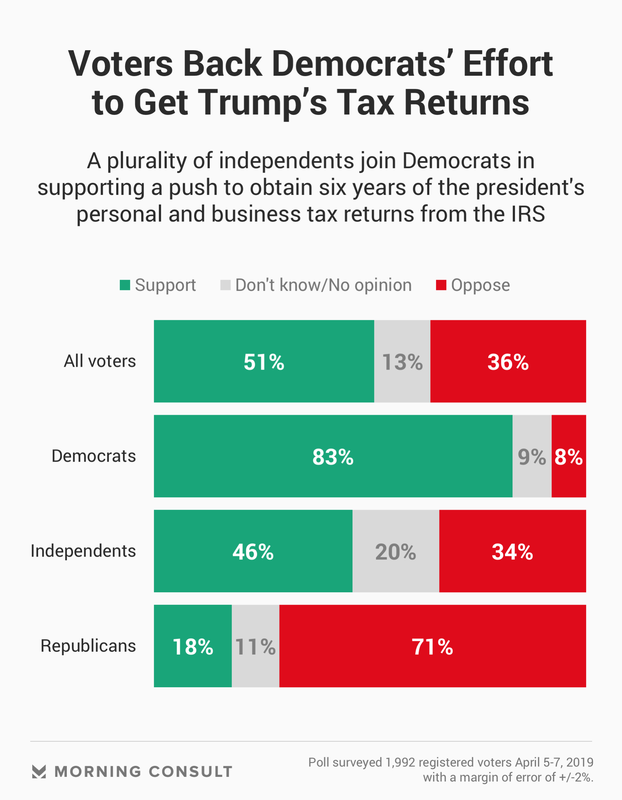 51% of all voters, including 46% of independents, back House Democrats’ efforts to obtain President Donald Trump’s tax returns. The issue splits along typical partisan lines, but 18 percent of Republicans support the push from the House Ways and Means Committee. White House acting chief of staff Mick Mulvaney has suggested the result of the 2016 election proves voters don’t care about seeing President Donald Trump’s tax returns, but a new Morning Consult/Politico poll finds most of the electorate is on board with Democrats’ efforts to get their hands on them. A slim majority (51 percent) of the 1,992 registered voters polled in the April 5-7 survey said they support efforts from Democrats in Congress to obtain from the Internal Revenue Service six years of the president’s personal and business returns, compared with 36 percent who oppose them. The move, initiated last week by House Ways and Means Committee Chairman Richard Neal, is supported by the bulk of independent voters (46 percent), but yields typical partisan divides. Still, more Democratic voters (83 percent) support the effort on Capitol Hill to obtain the president’s tax returns than Republicans (71 percent) oppose it. Nearly one-fifth of Republican voters (18 percent) said they support efforts to obtain the president’s tax information. Morning Consult polling has found views on Trump’s tax returns to be relatively steady throughout his presidency. The latest national survey, which was conducted online and has a margin of error of 2 percentage points, found that 49 percent of voters care that Trump has not released his tax returns — similar to the 48 percent in October and 45 percent in January 2017 who expressed that sentiment. As the Wall Street Journal Editorial Board noted Monday, Trump told CBS’ John Dickerson in February 2016 that he’d release his returns “over the next three, four months.” The issue was thrust back into the spotlight when Democrats claimed the House majority last fall, pledging to hold Trump to his word. Neal, a Massachusetts Democrat, has based his request on a law that requires the treasury secretary to provide “any return or return information” requested by the chairs of the House Ways and Means Committee, Senate Finance Committee and the Joint Committee on Taxation. On Tuesday, Democrats again pressed Trump administration officials on the issue when Treasury Secretary Steve Mnuchin and IRS Commissioner Charles Rettig appeared before House committees. “It is our intent to follow the law,” he told the committee.